Perhaps they thought that it would come easy. Perhaps they, with their fast-paced offense, their interchangeable parts, and their mad scientist like coach, who seems at times like he spends his nights somewhere in the catacombs of the Novacare Complex trying to concoct some magic potion which will create the ideal football player and the ideal scheme, thought that the “not quite ready for primetime” Atlanta Falcons would be in awe. Perhaps thoughts of enjoying the nightlife of Buckhead or Midtown, or taking in a tour of the Coca-Cola factory while wearing coke bottle glasses (rose colored no less) was on their minds. But whatever their assumptions may have been proved to be incorrect. For the first half, the Atlanta Falcons treated the Eagles like a ragdoll, imposing their will freely and moving the ball without much resistance, while the Birds offense moved slower than an Old City carriage ride. Give the Falcons credit. They came to play with first year head coach, and former Seattle Seahawks defensive coordinator, Dan Quinn at the helm. Even their docile fans, who usually seem more interested in the goings on of their favorite SEC college team, actually got off their hands to make some noise and support the home team. Atlanta is, after all, an organization who was fined for pumping in crowd noise through the speakers at Falcons games, since the crowd in attendance seems to have better things to do (cheer at an NFL game…what a novel concept). 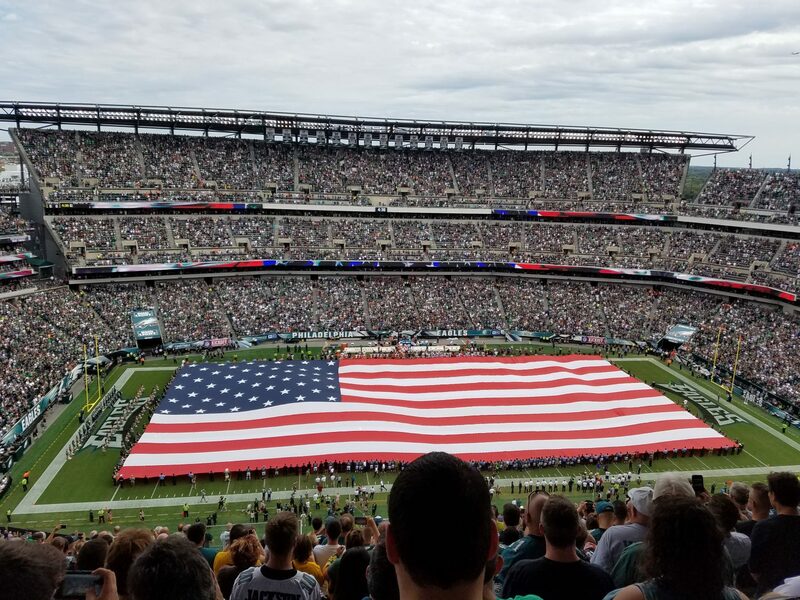 But with the Eagles down by seventeen at halftime (just as they were in last year’s opener against Jacksonville), they finally woke up to the fact that the 2015 regular season had begun and stormed back to take a 24-23 lead halfway through the 4th quarter. But penalties that plagued them throughout the game continued to rear their ugly head, and the kicker who was heavily reliable in 2014 suddenly has become very “Clark Kent-ish”, as Cody Parkey sailed a makeable 44-yard field goal wide right. Even with their bad start, this game was there for the Eagles taking. But another area of concern, one that many thought had been addressed in the off-season, was the play of the secondary. The Birds signed top free-agent cornerback Byron Maxwell away from Seattle in the offseason to shore up their cornerback play. But flip the syllables of his first name, and Byron becomes “Ron-by” Maxwell, which is ironically what Atlanta receivers did all game. Add to that the erratic play of the offensive line, and the defensive line’s inability to garner enough pressure on Atlanta quarterback Matt Ryan without blitzing, and you have all the makings of a well deserved loss. But while there is no such thing in the NFL as a “good” loss, perhaps this is precisely what the Eagles needed. Perhaps an 0-1 start is the catalyst for the Birds to come out ready to play every week from here on in. And what better opponent to take their frustrations out on as the Cowboys come to town for the home opener. Dallas squeaked out a late victory against the Giants on Sunday night after Eli Manning made some boneheaded clock management decisions while attempting to score, not score, run out the clock, etc. What he was ACTUALLY trying to do is anybody’s guess, but either way, it resulted in a gift win for the ‘Boys, and had all the “Romo-sexuals” (my name for the unofficial Tony Romo fan club) partying in Arlington late into the night. One would hope that the Eagles are not as generous and hospitable come Sunday at 4:25 PM. This contest will be the marquee FOX late game, and with roughly 99.2% of the inhabitants of the continental United States able to watch it (as well as those in Alaska and Hawaii), it is a chance for the Birds to show that they are ready for primetime in the 3rd season of the Chip Kelly experiment (not to be confused with the Alan Parsons Project). The Eagles would do well to get off to a fast start, as anything less would not only bring out the boobirds, but a disturbing, nagging fear that perhaps last year’s 1-3 finish was more than an anomaly. But as MAD Magazine’s Alfred E. Neuman once said “What…Me Worry?”. Birds win 38-24, and order is restored in the force…or at least in the Delaware Valley for one more week.